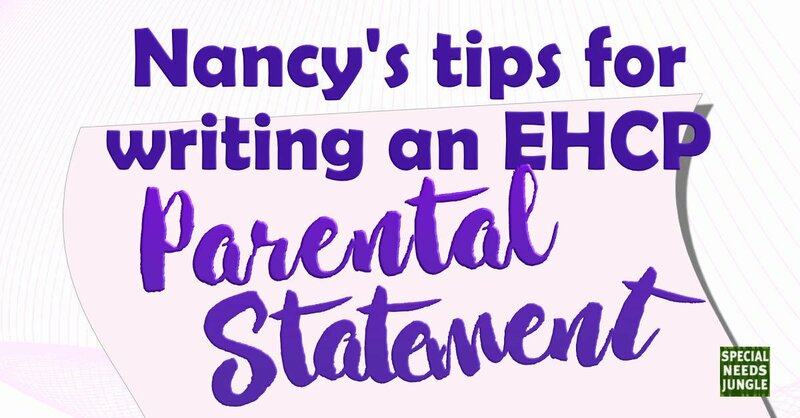 One of the things I get asked regularly, in my capacity of mother of an older child with Down’s syndrome, is how to write the parental statement part of the EHCP, either as part of the initial assessment or annual review. Seeing as my son is now 16 (I’m not entirely sure how that happened, the last time I looked he was in Reception), I’ve written a fair few of them and this column is an explanation of how I do it. It’s not intended to be the definitive guide, just what has worked for me. I don’t know about you, but whenever I get paperwork from the local authority, there is never enough room for me to write what I need to, so the first thing to do is to trawl the LA website and find the electronic template. If you google ‘parental contribution to EHCP’ you should come up with some that you will (hopefully!) find useful, and even better, the one that your LA uses. If you can’t find it, so long as you have access to a computer, it should be a relatively simple matter to create one of your own. The fuller and more informative your comments are, the better. The next thing that I do is to organise my contribution around themes, which in my LA are helpfully provided on the form (although the boxes aren’t big enough – don’t worry, I have told them!). I start by using the four big themes to start related to the four areas of need detailed in the Code of Practice. Cognition and Learning: This is where I detail the things he can actually do (as opposed to the things he can do sometimes). I try to keep it a positive list, as opposed to the negative one I have to write for the purposes of disability benefit assessment. I’d include reading, writing and maths in this part, and, when he was very little and we were making our application for his Statement, used the Portage Checklist to help me to describe his progress to date. Communication and Interaction: This is the part where I start to describe the things my son has difficulties with as well as his strengths. Sensory and physical: My son has various sensory impairments, so I detail them here. Social, Emotional and Mental Health: I detail his strengths and difficulties here. I think it’s important to write about both strengths and difficulties, making sure that I keep to the facts, rather than my hopes. I tell myself regularly that this doesn’t mean I don’t believe in my child, or have aspirations for him – I do, but this isn’t the place to write them. This is a really important section to add in, and I think, and I hope you don’t mind me highlighting it, especially so for Down’s syndrome. It is very easy for TAs or other supporters to overdo it with the help, so writing down what they can do for themselves and what they have problems with is a good idea. This is going to be more or less detailed, depending on the health needs of your child. It’s worth putting in everything, though, even if you don’t think that it has an effect on education. Even simple things like the number of appointments and check ups you need to attend together can have an impact, so put them in. Health How your child is faring, and anything that the reader will need to know that impacts on their daily life at school. Consultations How many you attend and in what area of health. Physical development I include things like: balancing, jumping, running, catching a ball. Again, the Portage Checklist was very useful to me in giving me a framework for find and gross motor development when my son was little. Hopes for the Future This was the part that I found most difficult to fill in in my son's parental statement, especially because when he was very small, the future was a scary place I preferred not to examine too deeply. When I filled this part in for the first time it helped me to split the idea of The Future into two, the long-term dreams and aspirations we have for our son, and what we hope he can achieve over the following year. I adapted our statement for a blog here. At our annual reviews, this gets read out to the group and it is a good opportunity to remind everyone that you love your child and you have hopes and dreams for them, exactly as you would for a typically developing child. I always think it’s a job well done when people start sniffing and reaching for tissues. A friend of mine includes a photo of her daughter, just to make sure that the people at the meeting know who she is and that she is someone’s precious child. You can organise your hopes for the future in exactly the same way as you have described their progress to date. I would tend along the line of organising my thoughts in order of importance to me, but that’s going to be different for everyone. On our LA form there is a section to complete about what helps us as a family. If this isn’t on your form, it’s worth putting that in. In this section I detail the kind of practical support we receive from other people, as well as routines and systems we have developed at home to help us get through the working week. As the EHCP is about education, health AND social care, there is an opportunity to write about how my son accesses activities in the wider community. I think it’s important to say whether children can or cannot do this with or without support. I always point out if there are things we would like to do but can’t because we have no one to help us. It can feel a little like climbing a mountain (especially if you have been busy filling in all the other forms, writing all the things again and again), so my final piece of advice is to be kind to yourself. Don’t try to do it all at once. If it all feels like too much, stop, and come back to it later. Once you have finished it, leave it for a bit before you send it off. Read it again, and add in anything else that you forgot – if you are anything like me (a busy, working mum with three children making multiple demands on my time) there are always things you think of after the event. Definitely agree with the adding photos bit, so much better to make it all personal. Because it is about a person, after all…. great tips in here, important for even us ‘oldies’ to remember, thanks! When you say “parental statement” do you mean parent views? LAs only use an outline from the law of what sections to include, there is a lot of variance between LAs in the details of how they seek information and some are dishonest in how they go about it. This is the reason for my question. Section A is parent views and LAs request this, along with child views as standard. But some are hiding the fact that in law parents can also supply a Parent Advice for Section K, which helps inform the actual content of the EHCP the same as any professional Advices. Some LAs are either ignorant and don’t understand the law or are proactively not informing parents of their rights to provide a Section K. It’s important parents realise they have this right. Good idea to do sections as you suggest, as part of that. Because the parent views request is often sent out on an LA produced proforma which asks basic questions such as “what is going well in school” “what isn’t going so well in school” which is ludicrous and obviously is tokenism in including it but actively ignoring vital information within it as nothing in Section A governs provision in the EHCP, making a Section K Parental Advice absolutely vital. Especially as non-private professional reports can be cursory and often contain inaccuracies. EHCP parental statement can contribute to identifying and detailing child/YP needs but if those needs are not also included professional reports with provision to meet each needs, then parental statement will be ignored.